Museum der Moderne Salzburg Mönchsberg Alberto Giacometti. The Origin of Space – Retrospective of an accomplished oeuvre 27.03.11 – 03.07.11 Thinned out, overstretched and fed up At the lower end of the elevator leading up to the Museum der Moderne on Salzburg’s Mönchsberg, the highly appreciative vernisage audience hardly left each other enough air to breathe. But at the other end of the elevator, which was full to the bursting point, the space opened up and the objects of art and desire presented themselves in the way the Museum had advertised: presenting Alberto Giacometti’s works at the same time as numerous premieres were taking place in Salzburg was destined to be a blockbuster. 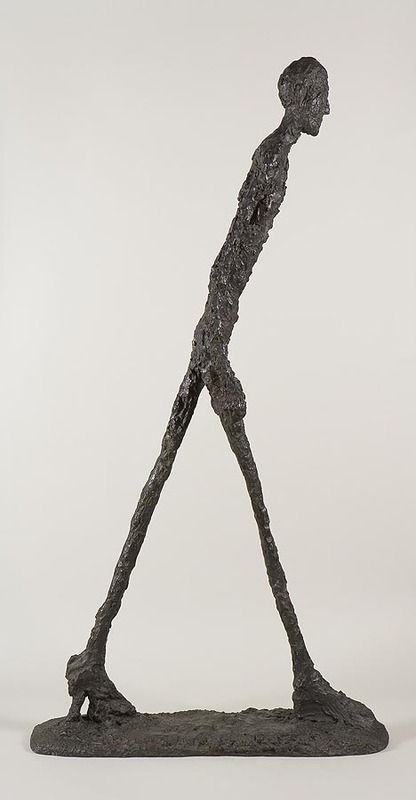 Rarely had Austria seen so much of Giacometti in the last 15 years. Yet the grandiose title “The Origin of Space” only applies to part of the 60 sculptures and 30 paintings and graphics. And it is exactly these figures and shapes, which one would normally consider as having helped an existentialist style into power, the existentially fed up thinning out, eroding, and overstretching, are put into the right perspective of autonomous works in, and with, the space. As microscopically miniaturized the little things present themselves, as oversized and excessive they appear in their almost unrealistically generously patinated aura, only to thereby launch space as an unstable dimension. In the preceding exhibition in the Kunstraum Wolfsburg emphasis was mainly laid upon the advertising power of the trendy “virtual space”, and Giacometti’s works were even positioned as virtual and existential in the developmental stage of computer generated worlds; this might have been a fashionable folly, and should not be unsettling. In Salzburg, preference is given to a presentation protected by an alarm system, which lets the anamorphic quality of Giacometti’s works appear like something that can be assaulted anytime and anywhere. So please do not enter! Failure, as an essential part of a dead serious game called existence, is continued one level down in a selection of more recent works. It seems natural to draw on Franz West’s “Formgebungen neurotischer Symptome” (forming techniques of neurotic symptoms) or on Bruce Nauman’s works pushed back and forth in Samuel Beckett’s shunting station. Among the highlights of the exhibition are Fred Sandback’s Minimalist line works made of yarn; he explicitly refers to Giacometti as having been “a major love affair”. With his stationary space installations forming both space and character he gets to the point – which will always be a line. By Stephan Maier Museum der Moderne Salzburg Mönchsberg 5020 Salzburg, Mönchsberg 22 Tel: +43 661 80 42 25 41, 23 36 Fax: +43 661 80 42 – 30 74 Email: info@museumdermoderne.at www.museumdermoderne.at Opening hours: daily from 10 a.m. – 6 p.m. , Wed 10 a.m. – 9 p.m. Open Space – Open Systems It’s the Political Economy, Stupid 16.03.11 – 25.04.11 Economic and political entanglements The four video works presented in the exhibition curated by Oliver Ressler and Gregory Sholette at the Open Space – Open Systems in Vienna, impressively show how economic and political intrigues influence the global changes in everyday life of a Lebenswelt encoded by western ideals. A video installation centring on the financial crisis, in which a hypnotist transposes the viewers into several abysmal scenarios, lets them slip into the role of George Soros and confronts them with the fear of financial ruin, is presented by Superflex. Damon Rich’s conversations between bankers, architects, investors and finance experts gives insight into the structures of privately financed housing projects in the US. They discuss the problems associated with freely circulating financial capital and its effects, which laid the basis for the crisis in 2008. Zanny Begg introduces the magician Mr. Invisible Hands in her video project and performs various tricks with a rabbit, created with the help of animated film. In this playful manner she successfully points to a topic, which, if it is concerned with boundless desires and tricks in the financial world of trading, is usually dealt with in a matter-of-fact-way. In numerous interviews, Libia Castro & Ólafur Ólafsson concentrate on lobbyists in the EU Commission, who are paid one billion euros annually to influence delegates. The statements are partly commented with a singing tone to make the absurdity of these activities even more apparent. With this contribution, the curators could not have questioned current political tactics more timely; they anticipated facts that have recently come to light in Austria. The exhibition will be presented in an extended version at the Austrian Culture Forum in New York in 2012. After three successful years of her internationally renowned exhibition practice, Gülsen Bal, the director of Open Space – Zentrum für Kunstprojekte, renewed the program: as of 2012, following a transition phase, Open Space will be renamed into Open Systems. In the future, Bal will be supported by an advisory committee and will no longer have to make decisions on her own; based on project submissions, a more open and discursive exchange with international artists will take place. By Walter Seidl Open Space – Open Systems 1020 Vienna, Lassingleithnerplatz 2, Schwedenplatz Tel: +43 669 115 286 32 Email: office@openspace-zkp.org www.openspace-zkp.org Kunstmuseum Bern DISLOCATIÓN. Cultural Location and Identity in Times of Globalization 18.03.11 – 19.06.11 Research work of social breaking points On the occasion of the bicentennial of Chile’s independence, the Swiss Embassy in Chile invited the Chilean-Swiss artist Ingrid Wildi Merino to organize an exhibition. 14 artists from Chile and Switzerland artistically analysed the political, social, and economic causes, conditions, and consequences of migration. At various venues in Santiago de Chile the works were presented in the form of a Biennial. Through its dislocation to a single location at the Kunstmuseum Bern in Switzerland, the exhibition lived up to its title: Dislocatión, and which, in turn, inevitably led to new conceptions and adaptions of the presented works. None of the artists misused the topic as a “do-gooder fig leaf”, as they have all been working in related fields for many years, something that clearly manifests itself in the urgency and coherence of the works. Dislocatión means to shift, displace and – used in a medical sense – to sprain. Marie-Antoinette Chiarenza and Daniel Hauser from the group RELAX try to put their finger on the reasons for the deracination of so many people and came to the conclusion that the reasons can be found in Chile’s neoliberal economic government, the first in the world to implement this system after Pinochet’s military coup against Allende in 1973. The installation, comprised of documents, videos and activities for visitors to take part in, uncovers - with a certain sense of humour - how a philosophy (that primarily assesses the benefits against the costs), becomes a lottery - with no winner in the end. Chile’s population still suffers from its traumatic experiences under the dictatorship. Camilo Yánez’s melancholic camera journey is memory work: during the days of the coup, Santiago de Chile’s national stadium served as a concentration camp. Here thousands were murdered, among them the famous singer Victor Jara, whose song “Luchín” accompanies the images of the empty stadium. The scars of the social breaking point, to this very day still marked by monumental inequalities, is part of Thomas Hirschhorn’s work in which he cuts the status symbol Ford Ranger into two parts. An adhesive tape provisionally holds the two parts together. Despite its convincing results, the exhibition does not lack self criticism: in an interview in Mario Navarro’s “Radio Ideal” it became clear that the diverse communication cultures did not offer the project an easy framework. the exhibition cannot veer out of the system that created it. It is also a kind of Dislocatión to present partly sellable works in a Pro Helvetia prestige object that offers internationally renowned artists a platform. The artists involved in the exhibition discuss globally relevant topics and contribute to the abstract phenomena of globalisation in differing views and memorable artistic forms. Throughout the exhibition, one is hassled by all kinds of sound tracks; the complexity of today’s world is meant to be endured. In reality, the exhibition is impertinent, a mental overload - and that is a good thing. It forces the visitors to expose themselves, to get involved, to take a close look, and to deal with the topic intensively – something that would not be possible if this were a superficial presentation. By Sylvia Mutti Kunstmuseum Bern 3000 Bern, Hodlerstrasse 12 Tel: +41 31 328 09 44 Fax: +41 32 328 09 55 email: info@kunstmuseumbern.ch www.kunstmuseumbern.ch Opening hours: Tue 10 a.m. – 9 p.m., Wed- Sun 10 a.m. – 5 p.m. Galerie Hubert Winter Mary Ellen Carroll – Proposals, Encryptions and the Death of a Typology (Architecturally Speaking 11.03.11 – 07.05.11 A question of the perspective Works by the American concept and performance artist Mary Ellen Carroll are currently being presented at the Galerie Hubert Winter. This is the fifth presentation of her work in Vienna. Winter is showing her earlier pieces whose differing intellectual levels flow into real aesthetic products - in contrast to later works such as “Nothing” (2007), in which Carroll only informs of an artistic action via a written report. Five monogrammed American wool naval blankets hang in the gallery’s main room. Black Bauhaus-style letters cover the beige background as if they were written with an oversized typewriter. At first glance it appears to be an English text, but upon closer view it's a phonetic transcription according to the American Heritage Dictionary. The text is Jonathan Swift’s angry satire “A Modest Proposal” (1729), in which Swift, due to the unbelievable famine in Ireland at that time, suggests to sell infants to be cannibalized by the rich. Swift even goes so far as to calculate the economic advantage and offers suggestions on how to prepare the dishes. Of course all of this misery is ascribed to the suppression by the English and even includes the beginnings of criticism of capitalism. Upon reading the entire text the feeling of bad taste and perversion prevails. The actual quality of Carroll’s work lies in its timelessness. Carroll fabricated these “written carpets” for the first time in 1990/91 and created a permanent element. She presented these works at the Gallery Winter in 1997 and again in 2011, they leave a broad scope for interpretation of political measures. The loveliest work at this exhibition is the “act of god” which engages Mies Van der Rohe’s famous “Glass house” in Illinois. It depicts five grey lithographic stones with photographs of a river in a monochrome blue. This is the view from the Glass House to the Fox River, which also defines the building’s character. Mies Van der Rohe attempted to design an airy house enabling its residents to live as barrier-free as possible with the landscape. How problematic this aspiration was and how his client, Edith Farnsworth, did not always appreciate it becomes clear in Farnsworth’s memoirs. Carroll superimposed the text in chapter 13 of these memoirs - in which the conflict with Van der Rohe is described - in the form of a binary code over the photos and incorporated the result in the lithographic stones. It is remarkable that Carroll not only hides the view of the famous house from us, but also provides us with the private appraisement, even if coded, of its commissioner. The extent, to which Mary Ellen Carroll is interested in architecture as a social element and how important changing intellectual viewpoints are to her, becomes clear in her rotating house project. One can watch the 180 degree rotation of the house on www.prototype180.com. The abstracted black-and-white drawings of these rotations, dating back to 1992, are displayed at the gallery. With her cubes and black lines she created a beautiful concentration of conceptual aesthetics. By Susanne Rohringer Galerie Hubert Winter 1070 Vienna, Breite Gasse 17 Tel: +43 1 524 09 76 Fax: +43 1 524 09 76 – 9 email: office@galeriewinter.at www.galeriewinter.at Opening hours: Tue – Fri 11 a.m. – 6 p.m., Sat 11 a.m. – 1 p.m.